I’m not sure when I first met George, but I think that the first time I played him was at a Gammonitis tournament probably in 2005. I remember the match to this day because I was expecting to beat the newcomer but in fact George beat me, and also because he chatted to me happily throughout the match while I became more and more unhappy as the score moved inexorably in his favour! Over the following years I realised that George would have chatted happily during that match even if he had been losing, because he was always good-humoured. George joined the UKBGF in 2015 as a 3-year Premium member and played in the UK Open Masters flight in 2014 and 2015. In recent years he also played at Blackpool, BIBA, London Players League and various London clubs. But probably George’s biggest win was the Main Intermediate flight at the 2008 Nordic Open, being the only non-Dane in a field of 78. As well as the cash prize I remember that George won a backgammon board, which for some reason he asked me to bring home to the UK for him. George’s funeral will be held tomorrow (21st December) and will be attended by his family and a few close backgammon friends. George’s family will be made aware of this obituary, so that they will be able to view any comments which players may wish to post below. 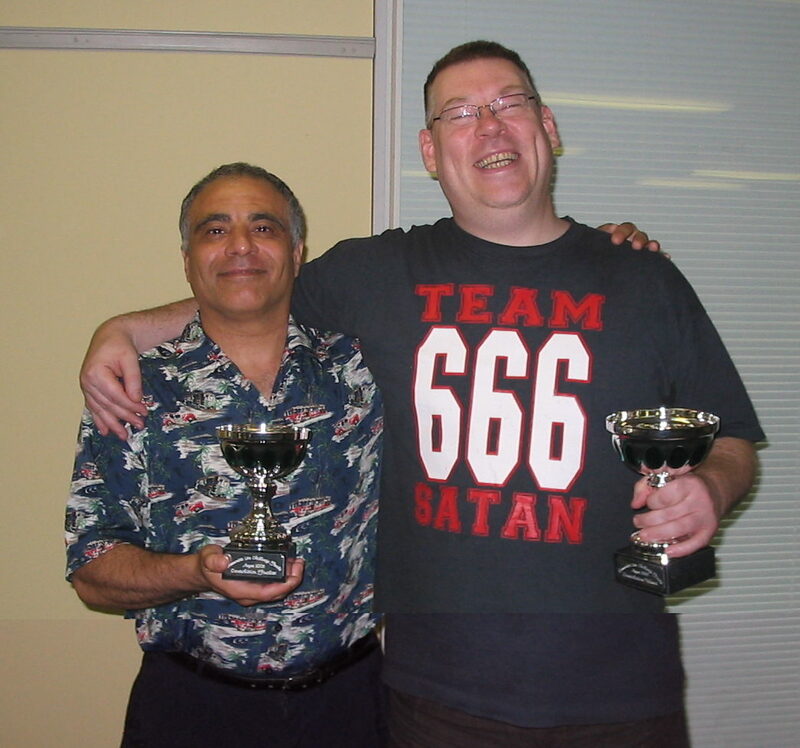 George’s friendly demeanour and banter will be greatly missed by the whole backgammon community. George was a lovely man and seemed to always be cheerful, bringing some enthusiasm to the chouettes. His presence often helped lift it from the rather dour affair it can be. I wished I’d played more with him but will always remember his enthusiasm for the fig tree that he found in my garden during my house-warming chouettes. I last saw George at BankGammon where we ended up being drawn against each other. Much to the chagrin of others awaiting us, we happily chatted away about all and sundry – I seem to recall I was saying that I remembered him walking around MC the one and only time I played there and was wondering who this happy chap was just wandering around seemingly without a care in the world, always jovial and full of anecdotal golden nuggets re the backgammon scene. Very sad news indeed. RIP George ! I was greatly shocked and saddened to learn of George’s passing. I returned to BG after a very long break, in 2013 and saw that there was a club in Crystal Palace. I went along, not knowing anyone and that was the first time I met George. He was sitting playing BG with Eric McAlpine and Alex Polden. He welcomed me into the group, chatting away, happily, and that just about set the course for the next few years. There was always loads of banter; George always had a non BG story to relate, which would invariably last the course of the night – often 3/4 hours – and would have us in stitches – talking non-stop whilst we were trying to concentrate on our moves. The next time we gathered we’d either get the next instalment, or a new story would begin. He was a lovely, lovely man with a heart of gold who loved his family…..he was also a fellow Greek Cypriot. RIP George, I shall miss you.